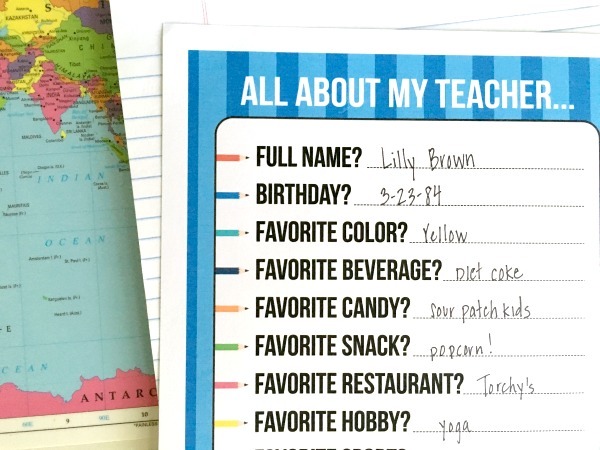 A Teachers Favorite Things - C.R.A.F.T. I can not believe that my kids start school in less than a month! In preparation for the big day, I like to print a few of these “All About My Teacher” printables to hand out on meet the teacher night. 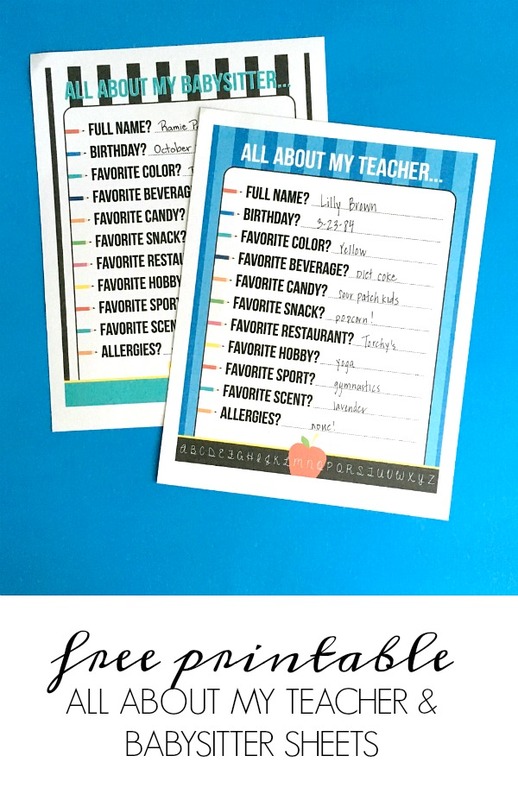 This one page free printable sheet has all of your bases covered so that you can surprise a teacher with treats you 100% know she loves! Apparently, sour patch kids and popcorn on a random Friday would be much appreciated by Ms. Brown! I had the same dilemma with babysitters. We finally got in a groove and have 2 regular babysitters that are a huge help during the day and on the occasional evening. At some point last year, I realized I didn’t even know their birthdays, and I love to celebrate birthdays! So, I asked Carisa from Messes to Memories to create 2 sheets: All About My Teacher and All About My Babysitter so that I could now a little but more about the wonderful people that teach and take care of my babies! I love that now I know Ms. Brown would really enjoy a Torchy’s Tacos gift card for her birthday on March 23. Which if you don’t have those in your town, I’m sorry and if you ever eat at one make your taco trashy, and thank me later, ha! Or that a diet coke and sour patch kids would be a much appreciated pick me up any day of the week. Maxwell loves bringing his teachers presents so even just handing these sheets to them was fun for Max! To get the “All About My Teacher” and “All About My Babysitter” free printable, just pop in your email in address and it’ll come right to your inbox! Oh and so you don’t loose the teachers favorite things lists, I keep mine hanging on the side of the fridge! Thought I’d pop over to see your blog. How fun is this! I love your topics, your sense of humor and your genuine connection with your readers. Congrats on your success! Thanks for sharing, what a great idea! !